Before starting to use FiltaFry services Dean College was using roughly 15 boxes of shortening per week at a cost of $346.20. In addition to the cost of product we were also allocating 8 hrs per week in labor to clean the fryolators at approximately $14.50 per hour ($116.00). This was a total cost of approximately $462.00 per week. 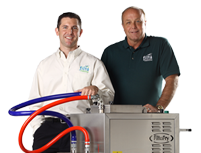 By using FiltaFry Service we have reduced our shortening purchases by 50% and eliminated the labor costs associated with cleaning the fryolators and changing the shortening. Not only is there significant cost savings associated with using this service, there is also the benefit of reduced risk of employee injury, partnered with top quality cleaning every time. I have used the FiltaFry service at my last two accounts. Filta and their team are true professionals that take pride in their work. I strongly recommend the FiltaFry service to any account with multiple fryolators.